Fujitsu fi-5530C2 Scanner Driver. 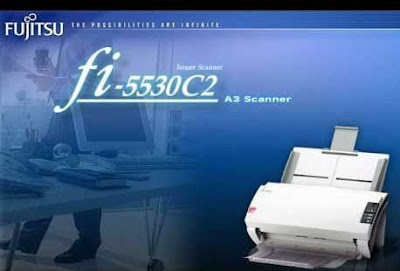 The fi-5530C2 Color Departmental Scanner from Fujitsu offers an amazing set of features in a compact package. With measurements of only 11.5 inches by 16 inches by 9 inches, this Fujitsu fi-5530C2 is a scanner for A3 capable of handling a wide variety of document sizes. In addition, the fi-5530C2 scans to speeds up to 50 ppm / 100 ipm (horizontal, 200 ppi), account with dual color CCD with real resolution of 600 dpi to capture subtle details and uses ultrasonic feed sensing double with what achieves a reliable automatic scanning. For greater ease of use, the fi-5530C2 includes a feeder automatic document (ADF) for 100 pages capable of manipulate documents of sizes that vary from 2.1 inches per 2.9 inches to 11 inches by 17 inches, plus. With ultra SCSI and USB 2.0 high-speed connections simplify connectivity added to this, with the capabilities of image enhancement provided with PaperStream IP and the advanced features included with the new PaperStream Capture, the Fujitsu fi-5530C2 scanner combines excellence in maneuverability with a better control of the content in order to provide results of an exceptional scanning at an amazing value. The administration of resources of the Scanner Central Admin software provides the IT departments an efficient way to manage a deployment of scanners between medium and large. By having information on remote access resources, now the departments of IT can allocate resources effectively based on volume scanning, the use of consumables, the schemas of depreciation and expiration of maintenance. On-site service helps maximize the time of functioning. The Fujitsu fi-5530C2 scanner comes with includes a 90-day Limited Warranty. The Fujitsu Computer Products of America, Inc., a subsidiary of Fujitsu Ltd., is a consolidated leader in the digitization industry of documents that offers innovative solutions and services scanning that allow our clients to resolve issues critical business productivity and optimize its operations. The provide cutting-edge solutions in document capture and workflow for commercial and personal environments, backed by a comprehensive portfolio of service and also support.